One Navy family went viral on Veterans Day thanks to an inspiring photo that captures their spirit and strength. In the photo, sailor Lamarr Hall is planking with his wife and fellow sailor, LeShaina, on his back holding their 1-year-old daughter Mia. The Halls are both in their Navy blue uniforms. Although the photo was taken back in March, it was shared on Facebook Friday and quickly captured the attention of more than 13,000 people. LeShaina Hall, 23, said her family took the photo right before her husband was set to go on his third deployment. "I like to take a lot of photos and make things with the photos for keepsakes when he and I deploy," she explained. The Detroit native said both she and her husband have been members of the Navy for five years and are both based in Pearl Harbor, Hawaii. LeShaina Hall said the viral photo captures the "strength" of their family. 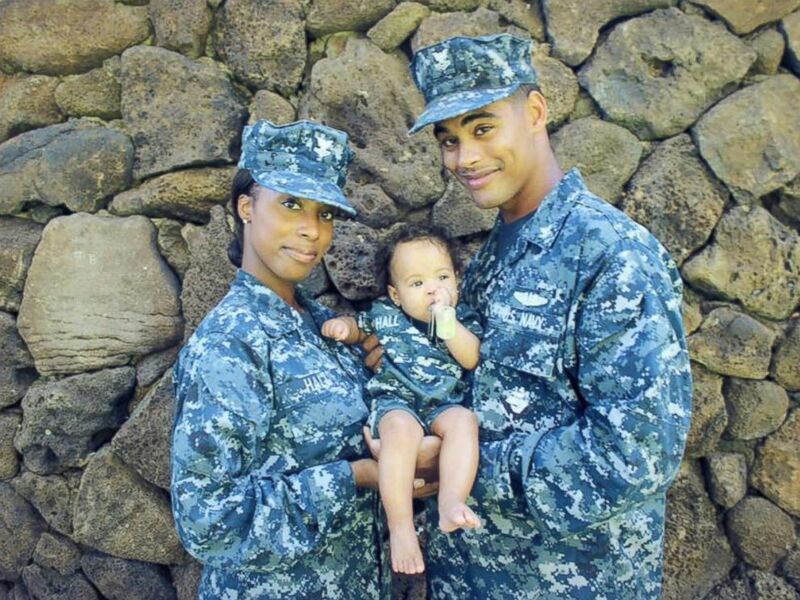 LeShaina Hall with her husband Lamarr, who is currently deployed in the Navy, with their 1-year-old daughter, Mia. "We go through a lot of things, with being apart, but it shows how strong we are as a unit," she added. "Even when we're together or when we're apart; it doesn't change no matter what." Despite the difficulty that their jobs bring, LeShaina Hall said she wouldn't change serving her country because they both can handle being apart. "When you understand what the other person is going through, when you know what it's like to be gone, you just want someone to be there waiting for you. It's so much better," she explained. LeShaina Hall said she "very rarely" speaks to her husband, who left in May, because he's underwater. Still, if she could send him a message, she'd like to tell him: "I love him and I miss him. I’m ready for him to come home."